Outline: Story of Gehazi. "Be sure your sins will be revealed" is the emphasis. Speaker is supposed to repeat this with dramatic emphasis whenever it comes in the story. Application underlines the fact that punishment for sin always comes, whether in this life of afterwards. God will heal the leprosy of sin for those who repent. Naaman had been healed of leprosy and he was so glad that he wanted to give Elisha a great gift. But Elisha refused it. He knew that it was not he who had healed this Syrian Captain, but it was God who had done it. Elisha's servant, Gehazi, heard his master say, "No, I will not receive any gifts." But Gehazi had a wicked heart. He thought, "Why should I not receive some of these riches which my master has refused? I will go secretly and ask for something." Perhaps Gehazi forgot the words of God which say, "Certainly your sin will be revealed." Then Gehazi went to his master. The prophet looked at him and said, "Where have you been?" "No place", he answered. Elisha said," I know what you did. You have not deceived God and you have not deceived me." Gehazi remembered the words of God, "Certainly (be sure) your sins will be revealed. "* And he knew they were true words. But it was too late. The judgment for him had come. Elisha said to him, "From this moment you will have leprosy all over your body, and not only you, but your children will have it, and your children's children will have it. This curse will remain with you forever." It was too late. 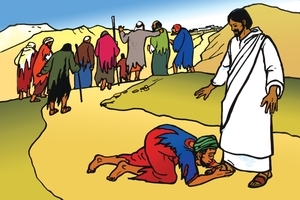 His opportunity to repent and leave his sins was past, and now he was receiving punishment. And Gehazi went out from the presence of his master. Sometimes punishment comes in this life and sometimes it does not, but we are all judged after we die. God's Book tells us, "It is appointed unto men once to die, and after that the judgment." (Man will die just once, and after that comes the judgment.) It also says, "There is a way that seems right to a man, but it ends in death." Those who have accepted the Saviour that God has sent, will go to everlasting life in heaven when they die, but those who have refused Him will go to everlasting punishment. The wages of sin is everlasting separation from God, and suffering in Satan's place of fire; but the gift of God is eternal life through Jesus Christ our Lord. "What shall it profit a man if he gets every material thing in the world, and loses his own soul?" Sin is like leprosy, and only God has the remedy to cure it. If you repent of your sins and turn away from all your evil ways, God will hear your prayer. Then ask Him to forgive you, and receive Jesus, the Saviour. When you have done this, God will help you live in a way that pleases Him. *Where appropriate, repeat this statement dramatically in the same way each time. REFERENCES: Heb. 9:27; Prov. 16:25; Rom. 6:23; Matt. 16:26. GRN has recorded a version of this script in 278 languages and dialects. See full list.